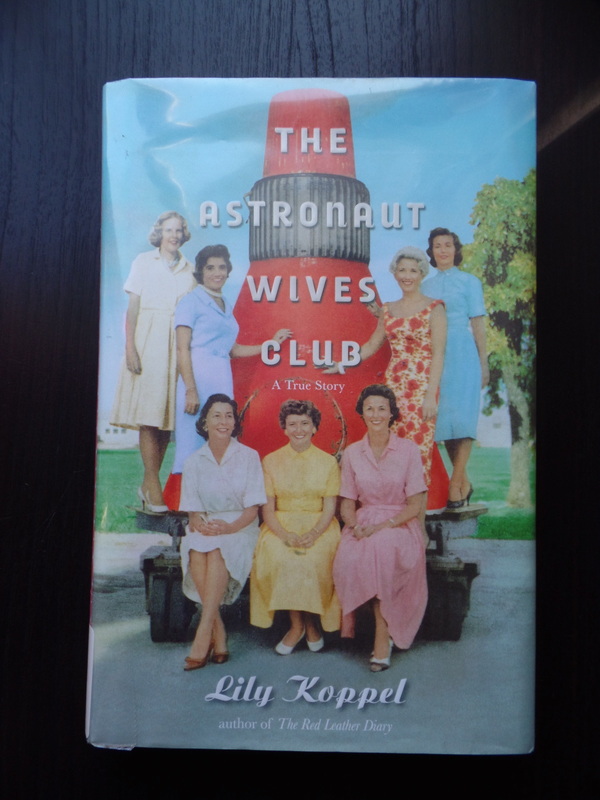 Literary Wives: The Astronaut Wives Club – The Bookshelf of Emily J. Every two months, a group of bloggers reads a book with word “wife” in the title, and we attempt to answer the following two questions in our posts. Please visit these other fantastic bloggers for their take on this month’s book, and if you’d like to join the conversation, on our blogs or on yours by reading along, feel free to do so. The Astronaut Wives Club (2013) a nonfiction book by Lily Koppel is a fascinating look at the women behind the men who went to the moon. However, it is also one of the worst written books I’ve ever read. While the story and the people were interesting, the writing made it hard to access. The incidents were disjointed and poorly described. It read like a collection of clippings from the interviews and archival sources, rather than a smooth narrative that moved linearly or artfully. As I read, I wondered if I had somehow lost my ability to comprehend what was going on, and I often had to reread passages to make sure I knew what was happening, and even then, I felt lost. However, after reading the reviews of this on Goodreads, I realized that it wasn’t me, but the poor writing of the book. That said, it was a fun way to learn more about the space program in the United States. I did not know much about it, other than the famous names, and I enjoyed hearing more about the men in the space program and about the women who were married to them. From their experiences, we learn a lot about what it means to be a wife. First of all, being a wife means being fully supportive, and no wife exemplified this more than Annie Glenn, John Glenn’s wife. They seemed to be a golden couple of that era, and John noted, “If it is what I want to do, she is behind it, and the kids are, too, a hundred percent” (p. 5). Being an astronaut wife also required stoicism. Their husbands were first pilots in the air force, many proving themselves in WWII, and then they became test pilots for space travel. It must have been nerve wracking. Life magazine had a special contract to publicize the lives of the astronauts and their wives. They presented a perfect image, transforming “seven very different, complicated women into perfect cookie-cutter American housewives. There was not a whiff of domestic turbulence” (p. 36). Yet many of these women put up with cheating husbands and even being left for mistresses. They put up an artifice of their lives, but underneath their marriages were far from perfect. However, “[n]o matter what a wife had to sweep under her carpet, keeping a peaceful marriage was not just an imperative of American womanhood, but in this day when everything could be wiped out at the push of a button, a matter of national security” (p. 39). In addition, “[t]here was an unspoken belief, especially among the guys, that if you got a divorce, you’d be done for” (p. 195). These men wanted to be the first to visit the moon, just as their wives wanted more than anything for their husbands not to die. They hid their infidelities, and when one of them decided to leave his wife for a mistress, he was dismissed from the program. The wives were also competitive. While originally there were seven astronauts and seven wives, the Gemini program introduced new families to the fame of space work. The original Mercury wives met and discussed not allowing the new women to invade their turf, for they had been given homes in Houston in special subdivisions, money from Life magazine, cars, and fame. They didn’t seem to want to share. As the space program progressed, and accidents happened, wives became expendable. They were only good when married to a live or useful astronaut. As soon as their husbands left the program or died, the women were ignored. After her husband’s death in a rocket accident, Betty Grissom was given the run around by NASA officials when she went to pick up her dead husband’s car. Overall, this book is an interesting look at the way wives were expected to behave just a few decades ago. It was a hard job, one that Barbara Cernan described thusly, “If you think going to the Moon is hard, try staying at home” (p. 250). These women had to have nerves of steel and had to allow the public to view their personal difficulties. It was interesting to note how many of the Astronaut marriages ended in divorce. It seems the publicity, the stress, and the time away from each other became too much for many of the couples. Betty noted, “[The press] tried to make them look like perfect American boys. Well, in most respects they were, but they were human, too, just like the rest of us” (p. 263). However, the women found ways to support each other through this difficult life experience. They formed their club, saying, “We were all finding our way through an experience that was a first—that of being astronauts wives and with the husbands away, we felt the need to support each other. So we began monthly coffees” (emphasis in original, p. 265). While being an astronaut wife was certainly hard and at times tragic, these women found a way to build their own community, based on mutual terror and sorrow, and supported each other through the experience of being an astronaut wife. You had some good points, especially about the stoicism and the writing! I was more offended by the spin Koppel gave to the information, making everything seem like an episode of Entertainment Tonight! Ah, I can see that! There was some sensationalism as well. Just overall not well done, but definitely interesting content. I can’t help but feel it was an opportunity lost. Maybe someone else will take the subject and do a better job. Thanks Emily. We have been watching the ABC miniseries, but neither of us have read the book. I did read and watch the movie The Right Stuff, so it is interesting to compare how the same wives and their husbands are portrayed. I have been wanting to read The Right Stuff for years now. I really need to make it a priority, especially since this book was so disappointing. I’ll have to check out the TV series. Yeah, it was a bummer! Thanks for reading. This is a fun blog series to be a part of. I found the same as you – interesting stuff, poorly organized. I also couldn’t help but wonder if the author was able to get the whole picture. With so many wives involved, it would be tough to interview them all and get all the stories straight. You’re right about them each needing their own biographies! I really want to see the TV series, despite not really enjoying the book. I DID enjoy the people highlighted. I think I need to know more and have a better picture of each one individually. I felt like you did to some extent as soon as I finished reading this, however, as I reviewed all the places I had stuck post-its I realized I felt better about it 5 weeks later. Don’t know why, I guess because I couldn’t honestly imagine how I might organize it better. It was a ton of material and I think it would be difficult to pare it down and make it flow better. I did feel it presented an accurate picture. I like that you mentioned the one astronaut who divorced his wife and married his mistress was dropped from the program. I thought it also interesting that the wives refused to allow her to participate in their club. I’m glad it redeemed itself somewhat for you after some time. I am still left feeling like I don’t quite know exactly who these women were. I do want to know more. I think this is a subject that deserves more writing and research, just in a different format, perhaps. Hmm, that’s interesting. I usually write up my notes right after I finish reading the book, but I can’t say that my opinion has changed over time. What an interesting concept for a blog series!! I like it! And am glad that you summarised that book so well so I don’t have to read it! So glad to read a review…I love the show, and have wanted to read the book but wanted to know a little about it. Is the show any good? The book really wasn’t worth the effort, but it is certainly a fascinating topic. It’s a typical abc show (a little cheesy), but I like the feminist undertones and I’ve always been fascinated by the events, clothing and social norms of the era. I’d say it’s worth watching !